Subject: [redroseauthors] Important Information for you all! It has been brought to my attention the owner of Ocean’s Mist Press was at Red Rose Publishing. She was writing under the name of Maria McBean. She submitted to us and gave us that name and signed her contract as such. When this was brought to my attention I ran her social security number and it showed that it did not belong to Maria McBean but belonged to Noemi Rivera. I am so sorry as I have concluded that she has commited fraud as she fraudulantly signed an alias and that makes her contract null and void. She has been removed from the authors loop plus her book has been taken down or in the process of being taken down at all the other places we are distrubted at. She has breached her own contract and is NO LONGER WELCOME AT RED ROSE PUBLISHING! Nor would she have been welcome if she submitted as herself. I wanted you all to know what was going on. I am so sorry as she SCREWED every one she has ever came into contact with. Take care and have a great evening! I wonder if Loose ID still feel comfortable having her in their stable? Or perhaps they’ve binned her already? Anyhoo, at least she’s getting just what she deserves. Thanks to you-know-who for the tip-off. BELLEVILLE, Ill. – A woman pleaded guilty Monday to killing her pregnant friend, the unborn child and the victim’s three children in a plea deal that allowed her to avoid the death penalty. Tiffany Hall, 26, pleaded guilty to all five charges against her — four counts of murder and one count of intentional homicide in the death of the fetus — and was sentenced to life in prison without parole. Hall struck her friend Jimella Tunstall, 23, on the head repeatedly with a table leg, then cut Tunstall’s fetus from her womb in a bathtub, prosecutor Robert Haida said. Tunstall bled to death, Haida said. 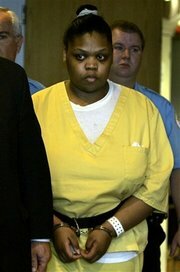 Hall then dumped her friend’s body in an East St. Louis lot. Hours later, Hall told police in Illinois she had given birth to a stillborn child. When police arrived, she had the dead fetus with her. She refused to be examined at a hospital. Three days later, Hall visited the father of two of Tunstall’s children and the unborn child, Haida said. The father was caring for all the children, Haida said. Hall told the father that Tunstall wanted her to pick up the children and Tunstall’s vehicle, he told police. The father told the officers that was the last time he saw his children, Haida said. Hall then drowned the three children — DeMond Tunstall, 7, Ivan Tunstall-Collins 2, and Jinella Tunstall, 1 — in the same bathtub where she killed their mother, Haida said. There are just so many psychotic people in this world. Surely somebody must have noticed that she wasn’t the full shilling? Her lawyer mentioned that she had a history of mental problems as well as a low IQ. What the hell does a low IQ have to do with anything? I hope she dies a horribly painful death. But somehow, even that would be too good for her. Thanks to AL for sending me the link.